A deceptively spacious, comfortable villa. The house is located on Marmara seaside, 7 km south from Sarköy city. 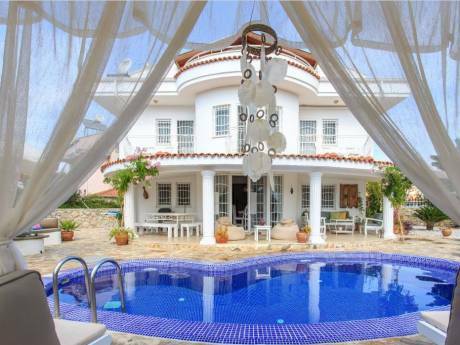 Well-equipped seafront villa,100m2, with 3 bedrooms. Description of accommodation: House stands on a hill upp, looking to the sea. Uppstairs there are 3 bedrooms and balcony. Freeview TV, large bathroom, hot water, toilet, well equipped kitchen, with fridge, microwave, outside in teras is grill. Well kept garden with roses. Turkish neighbours are very frienly. Sorry, no pets, children are wellcome! Foodstore half a mile. In the Countryside there are hills, green vineyards and olive groves near the coast. In Sarköy holds; marketday on friday, wine festival each autumn, watersport in citybeach and many other summerhappenings on citybeach promenad. This new palm promenad is full of people after 8 a,clock in evenings. After shopping day, just relax in Hamam -Turkish sauna, that You find from Sarköy city. Sarköy city belongs in large Tekirdag county, 200 km from Istanbul. Greece border is near. Nearest airport is in Istanbul. You can also stay some days in macig Istanbul on Your holiday. Town, &#350;arköy has the longest beach in Turkey, the 12th longest in the world.The district includes 60 km of coastline for tourism, fishing and prawn fishing. And it is possible to take a motorboat from here to Av&#351;a or Marmara Island. With all this to offer &#350;arköy is naturally popular with holidaymakers from Istanbul. In Sarköy area; long history including; fossils, ruined Byzantine houses and churches. 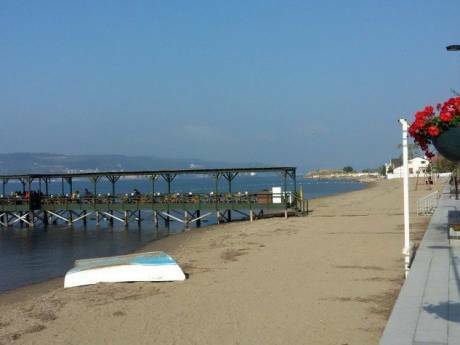 Have a day trip to Aasia side, Troya ruins and Canakkale city. Also You can spend one day on seaside mountains 30km, after Hosköy village. We are 4 persons family, me Anne, my husband Jukka, and sons Lasse,14y and Juho,12y. We live in Finland, near Helsinki (40Km). We have summerhouses in Estonia and Turkey. It is also possible exchange home to Finland, where we live. I stay at home, and Jukka works in IBM-company.